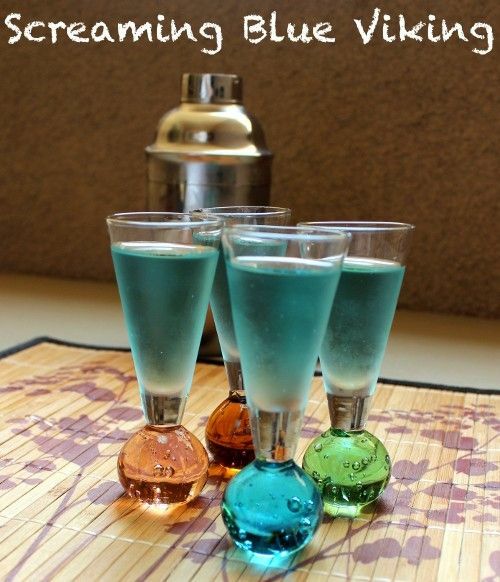 The Screaming Blue Viking is a strong drink that tastes most strongly like mint, with hints of honey and oak – and orange, if you use too much blue curacao. It’s a chilled shot that’s easy on the palate, which makes it a good choice for serving to guests. Since this recipe just calls for “parts” and “splashes” rather than ounces and tablespoons, it’s easy to make in any quantity you want. Mix a pitcher before a party and serve as either shots or cocktails. It’s also great for drinking games, like any tasty blue shot. Some of you have asked me where I got these shot glasses. Unfortunately, they aren’t made anymore. But they’re often on Ebay, so check this link to find a set. Or get these very similar ones on Amazon – I think I like these even better, honestly. Fill a cocktail shaker with ice and pour in all ingredients. Shake well and strain into shot glasses.